…But like most parents, this baby’s parents probably think he’s cute. A lot of times our websites are like that. We think it’s just fine, but everyone that visits knows – that baby is ugly! Are you the parent of an old, outdated website? Let me help you – if you haven’t updated your website in the last two years, the answer is YES! 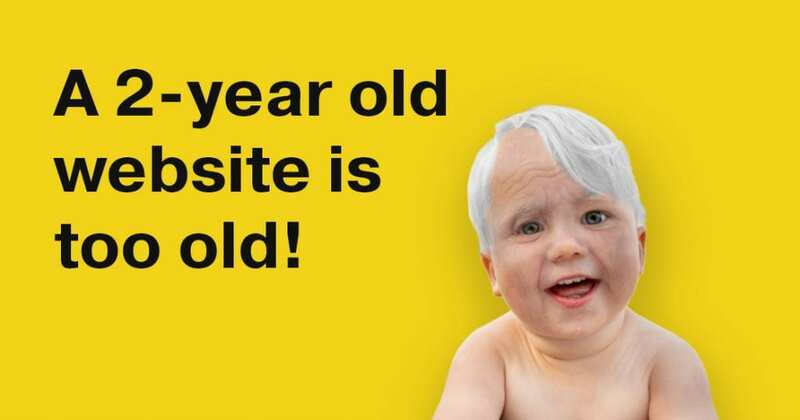 Technology, design trends, user behavior, Google indexing, security measures… Everything changes too quickly to let your website (which is often the hub of all your branding and marketing) stagnate and grow old. Design trends change each year. What was an attractive and eye-catching website two years ago may look dated or tired today. Not always, but many times. Compare your site to the industry leaders and look for commonality in design styles. You don’t want to copy the competition, just make sure you’re keeping up with them (or better yet, staying ahead). Technology changes rapidly to meet the needs and behavior of users. If your website is built on WordPress, for example, there have been several updates even this year that you’re not getting the benefit of. These updates effect the quality, speed, functionality and security of your website. Make sure your website’s technology is up to date. Protecting your website’s content and visitor information is crucial. It’s important to make sure your website’s security measures are up to date. This includes having SSL purchased and installed properly, as well as having Malware Protection and anti-spamming measures in place. This not only secures your website, but also gives you favorable standing with Google (Google rewards secured websites with higher ranking in the search results). Alive brands talk! Making sure your website content is up-to-date and relevant communicates that you’re still breathing. I get it. It’s easy to keep your head down and hand to the plow; but if you don’t look up every once and a while and communicate to your visitors you will inadvertently communicate that things are slow. (Hint – people don’t like to work with slow companies). So go ahead and do it. Take 10-20 minutes to go through your website and make a list of things that you can probably update. Need professional help? Contact Butler and we can schedule a consult.